Includes 1x SU3000rminet, with new cells installed. 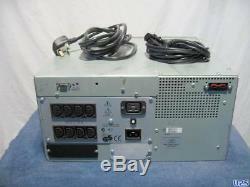 1x Input cable 2x output cables New stock of APC 3000 Units, complete with brand new batteries. 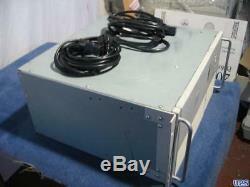 This UPS can accept additional 48V battery packs via a rear socket to increase runtime. It is also a handy feature to people who are building alternative energy solutions with solar / wind power. 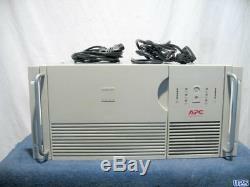 These units are lower power density hat the generation 2 UPS, but there are advantages in this. Firstly the ariflow path is better, and the thermal center is more distributed. Secondly the cell pack is much larger, giving a longer run-time. Like an old hoover, these keep on working, whereas newer units with more thermal stress and smaller, faster fans that they depend more on, stop. The units are fully tested by UPS experts, and are fully working. They are second user and will have cosmetic signs of previous use. We professionally refurbish including paint touch up or case re-spray as needed. The grading is A-Grade which we class as as good as you can get without having new. We have been supplying UPS since 2002 and are the respected leader in the field, with the most used stock in Europe. What sets us apart is that our experience reduces the occurrence of problems, and our professionalism and the availability of resources means we have the power to quickly resolve issues when they do arise. Under normal circumstances most orders before 3PM are dispatched on the day of order. Large units / quantities may roll over to being dispatched the next day. We try to meet all customer deadlines. All of our consignments are sent fully insured on a 24 hour service with our carriers. We cover all problems that occur in transit. We have the packing materials to make sure that there are few problems in transit. Our warehouse is based in the UK. Max Configurable Power 3,000 VA Max Configurable Power 2,250 Watts Output Voltage Distortion less than 5% at full load Crest Factor up to 5 : 1 Waveform type Sinewave Maximum height 9 inches (22 cm) Maximum width 19 inches (48 cm) Maximum depth 18 inches (45 cm) Rack Height 5 U Net weight 126 lbs. (57 kg) Online thermal dissipation 375 BTU/hr Control panel LED status display with load and battery bar-graphs and On Line : On Battery : Replace Battery : and Overload Indicators Audible alarm Alarm when on battery : distinctive low battery alarm : configurable delays. The item "APC 3000VA Rackmount UPS Brand new cells 12m RTB warranty" is in sale since Wednesday, November 14, 2018.